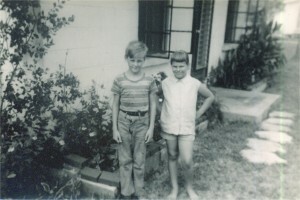 Grandpa decided to arrange for Tom and me to stay with Aunt and Uncle, my mother’s brother and his wife, in Sarasota. In this way, Mother could keep working on legal problems and we would be “safe”. My aunt put us back in school, I contracted chicken pox, and we lived a normal life. It is to my aunt’s credit that she was infinitely kind and fair to my brother and me, who were at the time virtually abandoned due to a difficult situation. My uncle and aunt, around the time of their marriage. The photo is damaged, but it is the only one I have of them from that time. This is how I remember them. My uncle passed away in February, 2010 at 85 years old. Aunt was only seventeen when she fell in love with my uncle. 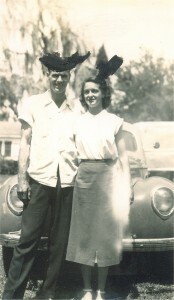 They met in Miami, where he worked after Navy service in the Pacific in World War II. She and my uncle decided to get a house and have everything arranged when she approached her mother about getting married. They talked to my grandfather and he agreed to give them the down payment on a house as a wedding gift. They bought the house and decided that they didn’t want to wait until she was eighteen to marry. My aunt’s mother said that if they wanted to get married without waiting, they would just have to go to Georgia to do it. Mother had a habit of feigning little confidences, no matter if the topic was of any importance or not. “Let’s go for a walk and talk,” she’d suggest, or “Let’s go in the other room, I have something to discuss.” The one who was singled out for “confidences” naturally felt special, and the one who was excluded naturally felt resentful. My mother would exclude my aunt even in her own house! As soon as her divorce was final, Mother came to Sarasota and took over my aunt’s house as though it were her own! My grandfather was under the impression, obviously conveyed by my mother, that we were not being well treated by my aunt and that it was urgent for Mother to do something right away to rectify the situation. In this way, the onus of the decision was placed on him. That was her way. She set him up to give her advice, leaving out or twisting the most critical details, and this made him feel responsible when inevitable disaster struck. He would reach into his pocket for more money or more gifts or more efforts on her behalf. And then she would end up with what she really wanted. …Glad to hear that you are all clear of court, etc. Now about your question of what to do, I cannot answer firmly on acct. of various conditions, but one thing I am sure of -you should not let the existing condition continue with the kids – enough damage to them has been done. As you suggested, you might hurriedly go to Sarasota and see if you can find a place to stay and job so as not to move the kids from school – if so let them finish there – if not I would not hesitate a minute in bringing them to Tampa. They may or may not be able to re-enter school there – believe the damage to them would be greater, and do more harm than the good from 6 weeks of school. In fact I believe they may as well have missed this term for all the good they will receive -as against the upset that has occurred. I know you had no alternative at the time – but now you have a chance to try and correct some of the difficulties. You are perfectly welcome to stay there with Mother – job or no job -as long as you wish – and all parties congenial. At any rate, I think you should let your brother out of the responsibility and make a final agreement of settlement for all their expenses – if you can’t pay now let me know what is due. Grandpa was clearly being put “on the spot” in this one. It seems that Mother’s suggestion to “move to Sarasota” was obviously what she intended to do from the start. She didn’t want to live in Tampa with my grandmother while my grandfather was away on business, because she couldn’t go out with men as freely as she liked. It was also her way to precipitate a crisis which put Grandpa on the spot so that he had to hurriedly send her a big chunk of cash rather than submitting her bills to him to handle directly. It never occurred to anyone to ask us how we felt. Were perfectly happy. Our lives were stable and “normal” for the first time in our experience, we had cousins to play with, and honestly, we didn’t miss Mother much at all. But Mother moved in. My grandfather, to ease what he knew was a potentially explosive situation, invited my aunt to come to the Bahamas for a week or two. She flew over with my baby cousin, leaving my mother to look after my other two cousins, my brother and me. Mother was supposed to find a job and a place for us to live. One night I awoke as though I had been thrown off a cliff, with the images of a very clear, powerful, and terrifying dream washing over me. I was sleeping with my head by a window. With my experiences of windows, it’s surprising that I could sleep at all this way! I actually felt as if I had been thrown through the window back into the bed, and as I hit the bed, that water had been splashed on me. This sensation of water flowing over my skin, the coldness and wetness of it, came at the exact moment that the well pump outside the house switched on, as it did whenever anyone opened a faucet or flushed the toilet. But I could hear no movement in the house to indicate that anyone was up using any water. My heart thudded wildly in my chest. I lay there trying to orient myself. I had a paralyzing sensation that there was, indeed, something outside, but I was unable to move. My dream was clear, and I struggled to deal with concepts that were far beyond the capacity of my child’s mind. In the dream, I saw the sky full of smoke and flames as if cities were burning. People were screaming and running down the streets in terror of huge reptiles stomping all over the place, silhouetted against the glowing red smoke pouring up from the landscape around me. Now, this was before Godzilla movies came out, but the imagery was pretty similar. In the dream, I knew I had to do something to save my family and get away. As I ran to sound the alarm, men who were more like creatures in uniform appeared in my path and grabbed my arms to stop me. They ordered me to come with them because there was something they wanted to show me. After her vacation at my grandparent’s home in Nassau, my aunt flew back to Miami and spent a few days with her own family. She took a bus back to Sarasota with my baby cousin, asking the driver drop her off at the end of the road to her house. She walked with the baby the rest of the way in the afternoon heat, tired after a 300 mile bus ride. When she got home, nothing had been picked up or put away. She found popcorn scattered all over the furniture and floor, dishes on the table caked with dried food, unwashed pots piled on the stove, unmade beds, and a pile of laundry in the bathroom several feet high. My aunt knew she needed to be calm and find out why the house was in chaos. She also needed a cup of coffee. She walked into her kitchen and opened the cupboard for a cup. None were there. She opened cupboard after cupboard to discover that her entire kitchen had been “rearranged”. Mother had decided that my aunt didn’t know the best way to set up her own kitchen, and took it upon herself to change everything around. After all, if she was going to live there, things ought to be convenient for her, right? We will pass with silence over the ensuing scene between my aunt and my mother. My aunt got pretty hot and said some choice words, but mother, as usual, facing the results of one of her manipulations, remained cool and calm, the only one in the room “in control” of the situation. The result of the confrontation: we were homeless. But not to worry! Since mother had found a job and could not possibly be expected to abandon it and go to Tampa, Grandpa was expected to fund a new living situation in a hurry. A large chunk of cash was dispatched to Mother, and she happily set about finding a place, getting us moved in, and settling down, free of parental control. Not only that, she had managed to provoke my aunt to a display of temper that “justified” all the mean things Mother had been saying about her. Charles was clearly gratified with our big-eyed, open-mouthed awe. We noticed he never seemed to have anything to eat, so we urged Mother to fill an extra plate. We took dinner to Charles and had an excuse to inspect all the interesting things in his studio while he ate. Naturally this led to a growing bond, which culminated one day in a most daring plan. We decided that it would be a perfect solution to everyone’s situation if Charles and Mother were married. We persuaded Mother to invite Charles for dinner. We set the table with candles in place and wildflowers for a centerpiece. We could hardly contain ourselves in our excitement to execute the plan. All through dinner Mother and Charles kept asking us what we were up to, and we just collapsed in giggles. Finally, dinner was over and it was now or never. My brother took a deep breath. Well, there were a few moments of resounding silence, and then Charles and Mother both burst into laughter. They had a good time for a while, going out to Mother’s favorite clubs and restaurants. Then Charles wanted Mother to settle down and take care of the family so he could concentrate on his work. Mother wanted to go out with her friends and apparently was doing just that whether Charles liked it or not. Charles, in his frustration, began to drink, and then they began to argue. I remember him shouting at her that she dressed up for other men, but couldn’t even give him the time of day. What she replied, I have no idea, but it exploded into violence. I remember the first time. As the sounds of blows and overturning furniture escalated, I crept from my bed in terror and peeked through a crack in my bedroom door. It was knock-down, drag-out, Mother giving as good as she got. I noticed the expression on her face as she wrestled and fought with him. It seemed she was enjoying herself. Her lip was bleeding, but Charles seemed to be in worse shape with a swollen eye and red marks and scratches all over his face and neck. The neighbors called the police. 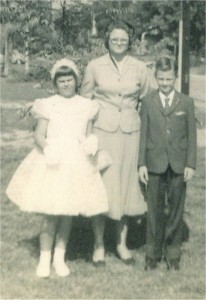 Mother rapidly straightened her dress, smoothed her hair, and wiped her face before answering their knock at the door. The policeman asked, “Any trouble here?” I was completely shocked to hear Mother say, “No. Everything is fine, officer. No problem”. My brother and I didn’t realize our mother was probably as much a participant as a victim in this struggle. W e decided to sleep with iron skillets under our beds so the very next time Charles started to rage and rant, we’d jump up and hit him over the head with our frying pans, grab Mother, and make our escape. Having a plan is one thing, but we lived in dread of having to execute this one. We were in our beds sleeping when the shouting and slapping began. I woke with a start. I don’t know about my brother Tommy, but I was lying there with my heart pounding, knowing I was committed to a course of action. Come Hell or high water, I was not going to back off. Tommy slipped into my room to see if I was awake and ready. I was. I got up and put on my bathrobe and we stood by the doorway with our iron skillets in our hands. I was seven and Tommy was eight. We were going to rush in and subdue a large man who was drunk enough to be dangerous but not drunk enough to be stupid. As we stood shivering, we realized discretion is the better part of valor. We conferred in whispers. Since our grandfather was visiting at Uncle’s house nearby, we’d slip out of the house and call him and let him handle this lunatic. But we had to pass through the living room to get to the door. Charles might stop us. At our house in Sarasota. We weren't very big, but we were creative and courageous! My brother told me to be ready to run on his signal, and I concentrated all my thoughts on holding my body ready to spring into action while he watched for the opportune moment. When it came, he whispered, “run!” and we both dashed to the door, tore it open and flung ourselves madly in the direction of the neighbor’s house as if veritable demons were pursuing us. Gasping for breath, certain of imminent doom, we rapped frantically on their window in a cacophony of cries: “Help! Let us in! He’s going to kill us!” And we really did think Charles would kill us for running away to tell on him. The neighbor came quickly to the door to let us in and we poured out our story, begging her not to let Charles in because he would surely beat us. Sure enough, in a few minutes he was pounding at her door. She told him he’d better run away quick because the police were coming. Only it was worse than the police: it was Grandpa! My grandfather was a man of few words, but when he did speak, everyone listened. And when he said a thing was to be done a certain way, it was done that way and no other. I can’t explain even today what quality in him produced this effect in family, acquaintances, and strangers alike, but there it was. I don’t know what he told Charles that night. But we never saw Charles again. We spent the night with our aunt and uncle. My aunt reports that my grandfather asked her if she would take us in for one night, even though he knew there was bad blood between her and my mother, and she kindly agreed that she would do anything for us kids, but nothing for my mother. I can’t blame her. The next day, we were packed up and taken with our grandparents to Tampa, and life returned to some semblance of normalcy. Grandpa was pretty disgusted with Mother. His letters from this time often pose the question to my grandmother: what are we going to do about Alice? It’s clear in retrospect that he was beginning to get an idea, after four marriages, repeating violence and family crisis, that something was wrong with Mother. Finally they set some rules she had to obey to continue to live on their bounty. Yes, she could work, in fact it was required, and yes, Grandma would take care of us; but no going out with men for the time being because, obviously, she simply had no judgment. No nightclubs, no dancing, no dates. Time to settle down and make some sense of your life. What did Mother do under these restrictions? Yes indeed! Church was the answer! Because, you see, how could my grandparents object to her going to church three times a week? And remember, churches are places to meet men, too! But churches can also be dangerous places for little girls who see Faces at the Window.